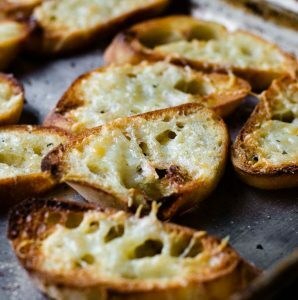 This simple homemade garlic toast recipe is crisp and golden brown on the outside and chewy on the inside. Add some cheese at the end for a delicious garlic cheese bread! There is something so comforting about a simple piece of homemade garlic toast. You can dip it into soup, serve it with an antipasto or cheese plate, or with some spaghetti. Instead of being slathered with garlic butter like most garlic bread recipes, the slices of bread are rubbed with fresh garlic. You’ll never want the faux garlic bread from the grocery store again! To make homemade garlic toast in the oven, you need to use your broiler. This gives the slices of bread the crispy exterior and soft interior. Some ovens have a variable-broil option, which lets you set the broiler at a high, medium or low setting. If you have this, use the medium setting for the best results. For this recipe, I recommend placing the rack in the second to highest level. This should put it about six inches away from the heat source. If you have a solid broiler temperature setting, you can still get perfect garlic toast in the oven by lowering the rack. What Kind Of Bread For Homemade Garlic Toast? The great thing about this recipe is that the method remains the same no matter what kind of bread you choose. For the best results, choose a super fresh loaf like an artisan bread you have to cut yourself. I recommend using a baguette, a whole loaf of french bread or Italian bread, or a sourdough. There is one major difference between this homemade garlic toast and Texas toast, which is the garlic butter mixture. To achieve something similar at home, you can brush your slices of bread with melted butter instead of olive oil. The thicker you cut your slices of bread, the more it will resemble Texas Toast. Instead of a ½ inch slice, aim for closer to a whole inch. Trade out the baguette for a wider loaf, like a french bread, for a more similar resemblance to Texas Toast. Even though this homemade garlic toast doesn’t use the traditional softened butter topping, it still has a lot of garlicky flavor. Garlic salt and garlic powder both tend to give a stale, and slightly strange taste to the garlic toast. By rubbing fresh garlic you get a stronger garlic essence without the heavy butter topping. If you want to take the garlic up a level, rub both sides of the garlic toast. This homemade garlic toast recipe is designed to be only slightly garlicky. If you want a stronger flavor, rub both sides of the bread with the garlic. Keep track of which slices of bread you’ve put garlic on by flipping it over after rubbing. Want a free printable grocery list for this homemade garlic toast recipe? Get it here. 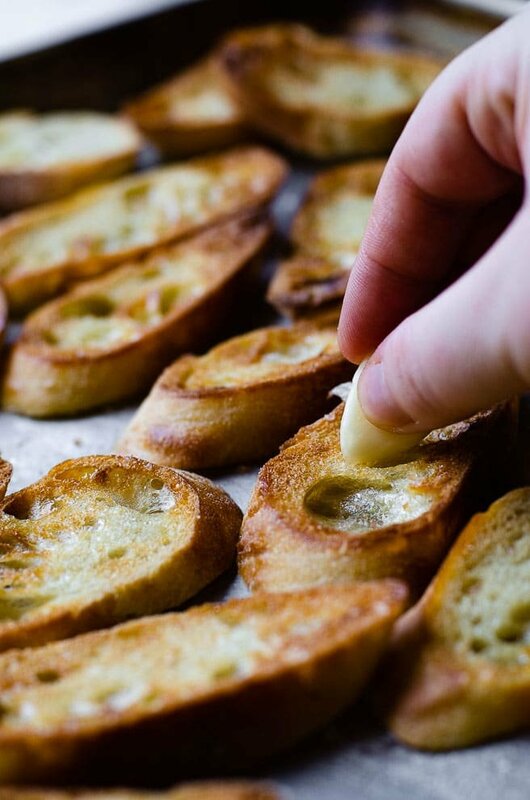 Use this ten minute quick method for getting delicious homemade garlic toast in the oven. 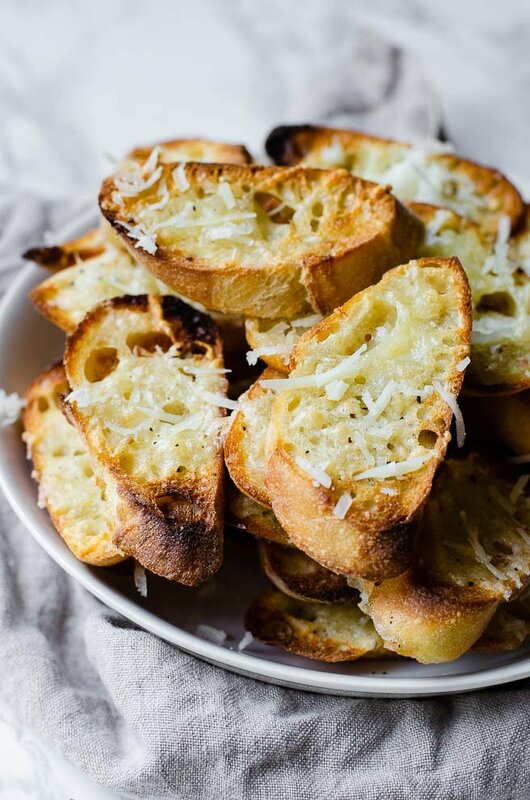 Vary the type of bread or thickness for a perfect garlic toast for your meal! Preheat your oven's broiler to medium and place the rack into the second to highest setting. (This should be about 6 inches from the heat source). Cut the baguette on a bias (at an angle) into thirty pieces, discarding the heels. Each piece will be about 1/3" thick. Place each slice on a baking sheet and brush one side with the olive oil. 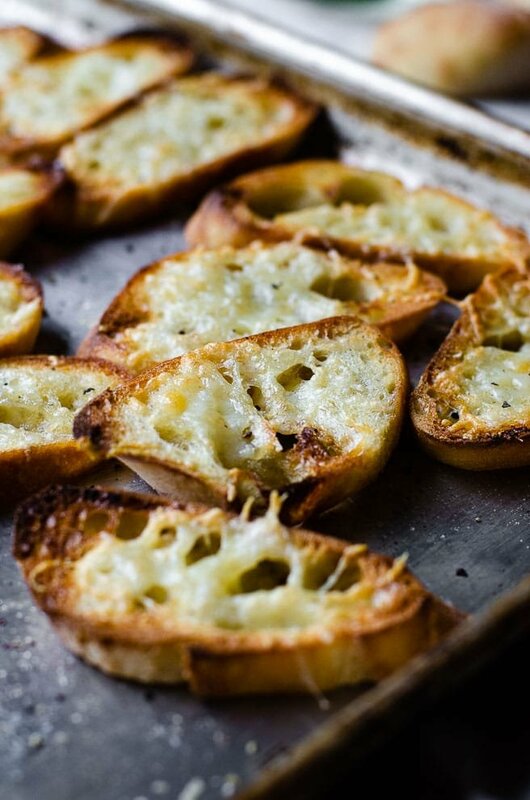 Place the garlic toast in the oven and cook for three minutes. It should just start browning on the edges. Remove the bread from the oven and rub each slice with the garlic cloves (like you're coloring it). Flip over the piece as you're done and put it back on the baking sheet. Optional: If using the parmesan cheese, sprinkle on top of each slice after it has been flipped. Return the garlic toast to the oven and cook for another two minutes. The garlic toast should be browned and the cheese melted. Remove from oven and serve immediately.